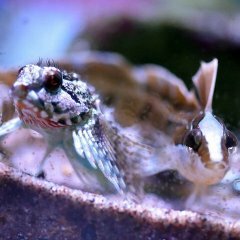 Hey guys new to the site and have a question on what type of bigher fish I can have in my tank. It's a 29gallon 30 in long. 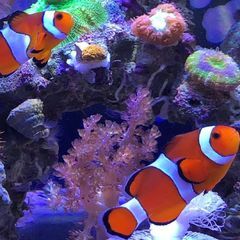 I have 1 clown fish (small), one blue damsel, 1 6 line wrase and a chocolate chip starfish. I dont have any rock just decorations. I love the flame angle but get mixed answers from the pet store if they can live in my tank. Thoughts? Also has anyone used the reef glass skimmer? Using a red devil 150 now but broke the mounting bracket so need a new skimmer. I would hate to put an angel in a tank without live rock... they like to pick at it. Your current fish are going to get pretty aggressive as they age and most of them are active swimmers already. Reef glass skimmer isn't powerful enough for your tank/planned stock imo... get something better. I used them on... 5-10g. Okay thanks on the reef glass was looking for a different internal skimmer. I've had all my fish for about a yr now, and all of them are extremely happy no nipping. Do you still think they will get aggressive? Idk with the live rock, inexperience? I've always thought the live rock seemed to grow alot of algae. At least the pet store looks like that. A couple of blue chromis. 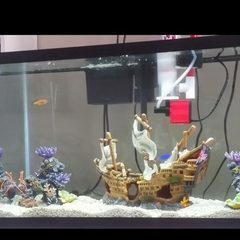 Here's another question why do some fish even if they are smaller require such a large tank? Example some puffer fish are 1inch but need 150 gallons? They are super active fish... they need room to swim or they get stressed. 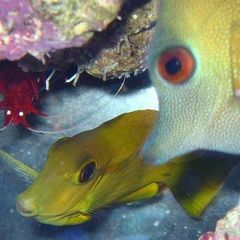 Some fish also turn aggressive in small tanks (this happens over time, not right away). I don't know of a puffer that is 1 inch... I think the smallest ones grow to 3 inches. A reef tank set up properly and maintained properly doesn't grow a lot of algae. Okay well what about a Valentini puffer for my tank then? I read one inch on a different puffer and saw (later) that that's just the size they sell them. Would that fish be ok in my tank and possibly adding some live rock for his teeth? Idk if he would use it or not. I did read they need snails or shrimp along with feeding. Is that a few a month, one a week or depends on the fish?